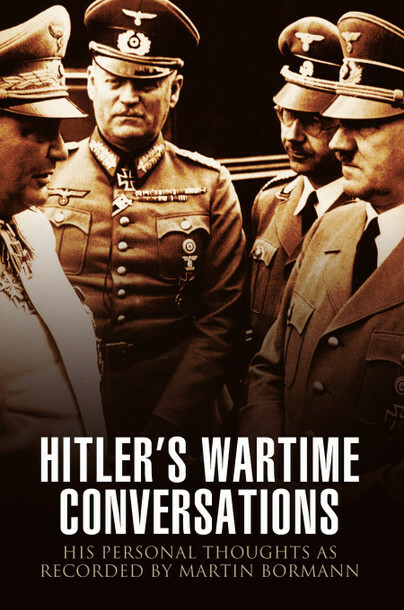 You'll be £16.99 closer to your next £10.00 credit when you purchase Hitler's Wartime Conversations. What's this? After dinner at the Wolf's Lair it was Hitlers custom to retire to his private quarters where Hitler and his entourage often listened to gramophone records of Beethoven symphonies, selections from Wagner while Hitler would hold forth with lengthy and rambling monologues touching on a wide variety of subjects. Hitler was invariably joined by Keitel and his two secretaries, also present was Martin Bormann who decided to commission a recording of Hitler's words for posterity. I would recommend this book to WWII junkies. I have not finished this book yet, but I wanted to give a review as I feel this book will take me some time to read. I was trying to read it as I would any other book, from start to finish. But I need a break. Am I say this is not a good book? Not at all! I am actually quite interested in what such a man was saying during the time he was trying to concur the world. I just am not able to read this book from cover to cover without taking a break. I am on such a break now. I will definitely finish this book and look forward to doing so. I just need something else in between. I'm not a fan of Hitler. As a matter of fact, I wish he had never been born. . . but these pages give insight into his evil genius. I have read Mein Kampf and Hitler's Second Book for a college course on the Third Reich, and I would say that this third volume is a necessary edition to understand the psyche of this man. Those with an interest in the time period should give this a read. What a great book!! It kept me engaged from the beginning until the end! I cannot wait to read more from this author.